New water treatment goals for disinfection byproducts (DBP) and for microbial inactivation will increase the need to consider new disinfection technologies. Ozone is an attractive alternative. This technology has evolved and improved in recent years, thereby increasing its potential for successful application. It is important to note that ozone, like other technologies, has its own set of advantages and disadvantages that show up in differing degrees from one location to the next. oxidizing agents. 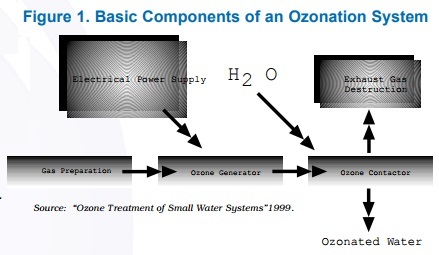 Ozone is manufactured by passing air or oxygen through two electrodes with high, alternating potential difference. In the next century, small water systems will need to use disinfection methods that are effective for killing pathogens without forming excessive DBP. Disinfection byproduct compliance is more likely to be a problem for small water systems treating surface water than for those treating groundwater because surface water sources tend to contain more natural organic matter that forms byproducts when mixed with disinfectants. In August 1997, the U.S. Environmental Protection Agency (EPA) listed ozone as a “compliance’’ in the requirements of the Surface Water Treatment Rule for all three sizes of small drinking water systems. • It will not oxidize some refractory organics or will oxidize too slowly to be of practical significance. Design of an ozone system as primary treatment should be based on simple criteria, including ozone contact concentrations, competing ozone demands, and a minimum contact time (CT) to meet the required cyst and viral inactivation requirements, in combination with EPA recommendations. Systems that need to provide CT to comply with the Ground Water Disinfection Rule, but are also having problems with DBP or maintaining distribution system residuals, should consider using ozone as the primary disinfectant and then chloramines for distribution system protection. Ozone has been observed to be capable of disinfecting Cryptosporidium, and there is significant interest in this aspect of its application. Available data indicate that a significant increase in ozone dose and CT may be required as compared with past practices. Therefore, these needs should be considered in planning. The standard oxidation-reduction potential and reaction rate of ozone is such that it can readily oxidize iron and manganese in groundwater and in water with low organic content. Groundwater systems that have iron levels above 0.1 milligrams per liter (mg/L) may have iron complaints if ozonation or chlorination is added. Because humic substances are the primary cause of color in natural waters, it is useful to review the reactions of ozone with humic and fulvic acids. According to different authors, ozone doses of 1 to 3 mg O3/mg C lead to almost complete color removal. The ozone dosages to be applied in order to reach treatment goals for color can be very high. It is interesting to note that when the ozone dosage is sufficient, the organic structure is modified such that the final chlorine demand can decrease. The National Secondary Drinking Water Regulations recommend that the threshold odors number (TON) be 3 or less in finished water. It has been shown that ozone can be effective in treating water for taste and odor problems, especially when the water is relatively free from radical scavengers. to determine the optimum choice of ozone and downstream treatment. (for example, decarboxylation of amino acids) or the formation and loss of volatile compounds through stripping. It is important to understand that the coagulating effects of ozone go beyond any direct oxidative effects on organic macro-pollutants. For this reason, one must be wary of studies claiming improved removal of organic matter when the data are based solely on color removal or ultraviolet (UV) absorbtion. Also, when studying the removal of DBP (for example, trihalomethanes), one must be careful to incorporate controls permitting the separate evaluation of ozone’s direct effects. Finally, the coagulating effects of ozone may not be observed with all water. Whenever considering the use of ozone as a coagulant aid, the preozonation effects should be critically evaluated in pilot studies incorporating the proper controls. Ozone, like any other oxidant, such as chlorine or chlorine dioxide, has a lethal effect on some algae or limits its growth. Ozone is also capable of inactivating certain zooplankton, e.g., mobile organisms, Notholca caudata. Such organisms must first be inactivated before they are removed by flocculation and filtration. The alternative use of ozonation has generated much interest because of its ability to avoid the formation of halogenated organics inherent in the practice of chlorine treatment. However, raw water quality significantly affects ozonation results and could lead to the formation of other undesirable byproducts. Brominated byproducts are a major concern in source waters containing bromide. Ozonation produces its own byproducts, such as aldehydes, ketones, and carboxylic acids. Assuming equivalent disinfection, benefit is achieved as long as the health concerns for the new products are less than those for the chlorine byproducts. Personnel time requirements for system cleaning may be fairly substantial. However, recent advancements in ozonation technology include use of high purity oxygen feed systems, rather than ambient air-feed systems. Ozonation treatment is therefore said to run cleaner and require less cleaning-related maintenance than had the earlier versions of this technology. Ozone will not provide a disinfecting residual that protects finished water in the distribution system. Therefore, the role of chlorine as a disinfecting agent is not entirely replaced, and its use in either the free chlorine or chloramine form will be required for this purpose in many locations. ensuring the effective and safe operation of the total system may be added to the five-component system shown in Figure 1.
feed stream, which is easier to dry and can accommodate simpler, less maintenance intensive drying devices than were typically applied in larger systems where lower-pressure compressors are typically used. Alternatives for application of oxygen-rich feed gas streams have also emerged for small system applications in recent years. These include purchasing liquid oxygen and using small package oxygen generation systems that are based on pressure swing adsorption. The use of these oxygen-enriched feed streams allows improved electrical efficiency in ozone generation and yields a product stream with a higher ozone content. Ozone off-gas destruction is the final major component in the ozonation process. This system is required to remove ozone from spent off-gas streams, which are collected and treated prior to discharge into the atmosphere. Both catalytic and thermal destruction devices are used for this purpose or by passage through GAC. EPA notes that ozonation technology requires careful monitoring for ozone leaks, which pose a hazard in the work place. As with any other chemical, the Occupational Health and Safety Administration (OSHA) has established maximum contaminant inhalation guidelines for ozone in the work place. Ozone concentration of 0.1 part per million inhaled during an eight hour work period in a work area is the maximum limit set by OSHA regulations.